Altara - When did the early Muslims consider Muhammad to be an actual historical figure? We do have relatively early sources mentioning or referring to Muhammad. Now, you argue that these sources do not establish Muhammad's historicity and only retell what the Muslims themselves say. Okay. But does this mean that the early Muslims considered Muhammad to be an actual historical figure very early on? Say, around the beginnings of the "conquests"? Or what was Muhammad for the early Muslims, if the based him on the Quran? Altara - When did the early Muslims consider Muhammad to be an actual historical figure? We do have relatively early sources mentioning or referring to Muhammad. Now, you argue that these sources do not establish Muhammad's historicity and only retell what the Muslims themselves say. Okay. But does this mean that the early Muslims considered Muhammad to be an actual historical figure very early on? Say, around the beginnings of the "conquests"? Or what was Muhammad for the early Muslims, if the based him on the Quran? but That important question will have a very simple answer if you could name some Early Muslims and tell me their life story or what they did as Muslim dear Mahgraye ..
A total of eleven sources: Doctrina Iacobi nuper Baptizati (July 634 CE), The Miaphysite Account of 637 (637 CE), The Apocalypse of Rabbi Shimʿōn b. Yoḥai (635–45 CE? ), The Khuzistan Chronicle (ca. 660 CE), the writings and chronicles of Jacob of Edessa (ca. 640–708 CE), The History of the Patriarch of Alexandria: The Life of Patriarch Benjamin (before 717 CE), The Spanish Eastern Source (ca. 741 CE), The Syriac Common Source: The Chronicle of Theophilus of Edessa (ca. 750 CE), The Short Syriac Chronicle of 775 (ca. 775 CE), The Zuqnin Chronicle (ca. 775 CE), A Report from the Continuatio of Abū l-Fatḥ’s Samaritan Chronicle (seventh century? ), and ʿUmar’s Letter to Leo (eighth century). How many mention his name in these sources, Maghraye? OOps there are more than 11 ., I guess I made a mess of your post dear Mahgraye.., That is all ? only 11? or would you like to add more to that list ?? Sorry. Twelve first century sources. A total of 14. Hu! 1st century? When Altara singing that "No Mecca" song ., that timing of Islam need to be moved up to 7th century and 8th century dear Mahgraye.. I am going to carefully look in to those 14 original sources you have suggested.. Any internet or book links on those 14? So those three books are good enough to solve all the problems of Early Islam and gives proof to Prophet of Islam "Muhammad.."
am I right dear Mahgraye?
? Proof of what? First century AH is the seventh century CE, the secon century AH is the eighth century CE. No. Just the references for the sources. Not sure. Maybe. Nontheless, they are very important and crucial to the question. Altara - When did the early Muslims consider Muhammad to be an actual historical figure? We do have relatively early sources mentioning or referring to Muhammad. What says about this the 9th c. sources which recount to us this history? Now, you argue that these sources do not establish Muhammad's historicity and only retell what the Muslims themselves say. 2/What happened (after) the traditional account which is supposed (by the 9th c. sources) at the origin of the conquest whose the different actors are clothed as "Muslims" by it, whereas none of these actors attests of their "Mecca/Medina/Kaba" origin. But does this mean that the early Muslims considered Muhammad to be an actual historical figure very early on? What is written at that time (and often today as well) and given the stakes involved (the Biblical God speaking personally to an Arab prophet depicted in the Quranic texts) is thought to be true, therefore historical by the Arabs. At last God talk to us! One of US!, etc. Say, around the beginnings of the "conquests"? Or what was Muhammad for the early Muslims, if the based him on the Quran? Work on your 2nd question. Well, they think he was a historical person right from the beginning. Their Prophet. My understanding is that you say that they understood "muhammad" (and other references) in the Quran as an actual persons, as prophet speaking to God, from the beginning. Not sure what to say. Work on your 2nd question in putting aside Mecca/Medina/Kaba (if you can...). It is only in putting aside it that you can understand what happened. You have to read what the 9 th c. sources recount about the 7th c. without it carefully. Okay... Will do so. Should put aside Muhammad as well in doing that? Look how accurate muslim historiography is! Even the cousins and nephews of Mohammed are recorded without error 200 years later (written post 850). 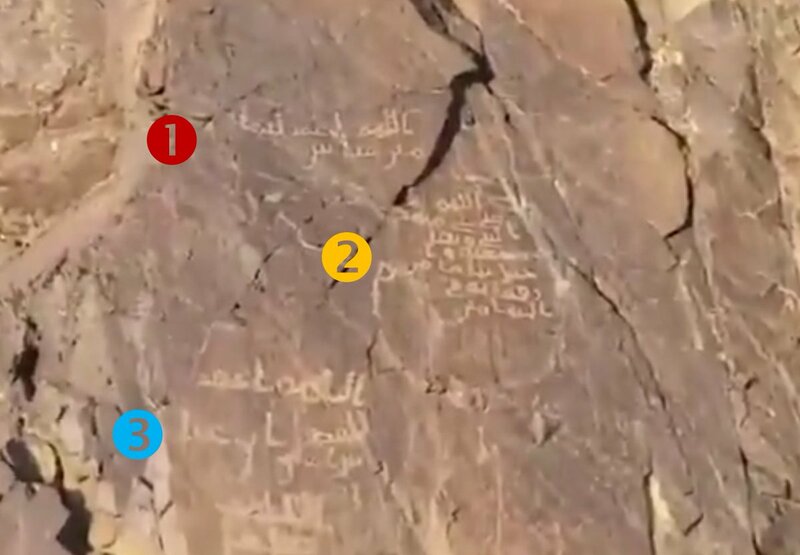 There must be divine intervention here, no history EVER has been written with so much detail and ALL correct (graphitti prove it, and they CAN'T be faked, Saudis are not capable remember). Did Dye has RT the tweet? Mecca/Medina/Kaba (and nowhere else...)are the places supposed to have hosted him in all the narratives. If it is not those places, what else is wrong/inexact in the narratives? There is an unwavering link between him and those places. The "further North" argument is not tenable as I have (already) explicated why many times. Christian Robin is pouring all his articles (mainly French) in academia. yes shahanSean twits are "praise worthy" and careful dating of such stones could tell us a bit of history about the origins of the WORD "Muhammad "..
indeed it is exciting to read all the rocks across the sand land and around the globe.... and i must agree with this..
......Arabic has influenced many languages around the globe throughout its history. Some of the most influenced languages are Persian, Turkish, Spanish, Urdu, Kashmiri, Kurdish, Bosnian, Kazakh, Bengali, Hindi, Malay, Maldivian, Indonesian, Pashto, Punjabi, Tagalog, Sindhi, and Hausa, and some languages in parts of Africa. hi Mahgraye .. How can we do that when that word "Muhammad " is in the center of Islam., that word is the "SUN OF ISLAM" and everything in Islam goes around that word..?? i too wish to know the answer to that., if you know it already please share..
Did Anthony say or imply any of this...? It is my conclusion. Do you disagree? lol.... Yes.. yes...What is AH anyways?? what year /date did it start? on the birth day of Prophet of Islam? 29 August 570 CE?? You are a wonderful person dear curious-lurker .. Thank you for the link., your graceful response made me to look like an idiot . .. lol.. So A. H. is an abbreviation ., Hmm now I wonder., Is it "after hegira,"?? or "Anno Hegirae." ?? When Prophet Muhammad(peace and blessings of Allah be upon him)small town in Arabian desert Mecca and most of the town people knew him as a good and honest person and when he started to tell his town people of Mecca about the message of Allah, he expected them to believe in the message and follow him (peace and blessings of Allah be upon him) without any question but the people were living in an environment of many evils. They were engulfed in idol worship, racism, tribal and family pride and many types of injustice. It took great faith and courage for the Prophet (peace and blessings of Allah be upon him) to trust in Allah and proclaim the message, knowing very well the negative response that would likely follow. But this was not the only act of faith that the Prophet (peace and blessings of Allah be upon him) exemplified; in fact, making Hijrah to Madina took enormous reliance on Allah and fortitude to face fierce enemies while laying the foundation of a solid Muslim community. The disbelievers of Makkah were angry when the Prophet (peace and blessings of Allah be upon him) proclaimed that they should not worship idols. These idols were made of stone and all sorts of materials (some were even made of dates). The Prophet (peace and blessings of Allah be upon him) told them that they should only worship the One true Lord of all Creation who had sent many prophets and messengers throughout time to guide humankind. Devotion to the stone gods was one reason why many insisted on disbelieving in the Prophet (peace and blessings of Allah be upon him), but another important aspect was based on pride, as the Quraysh (the main leading tribe in Makkah at that time) had been, for generations, responsible for providing for the pilgrims who came to Makkah every year at the time of Hajj. At that time the Kabah was filled with idols and Quraysh thought that if they believed in the Prophet (peace and blessings of Allah be upon him) and followed him, they would lose respect among the other tribes and this important role that had been given to them by their forefathers would be removed from them. Moreover, with the pilgrims every year, also came much economic wealth. In following the Prophet (peace and blessings of Allah be upon him) the people of Quraysh felt they had a lot to lose in worldly terms. Little did they know how much they would lose in the Hereafter if they insisted on their disbelief! 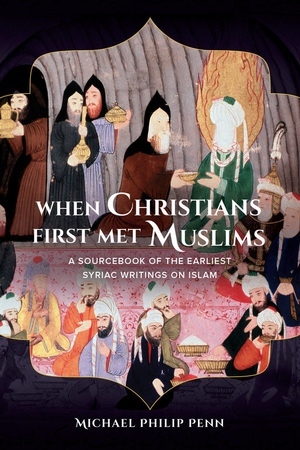 While the Prophet (peace and blessings of Allah be upon him) was patiently, gently and persistently proclaiming the message of Islam, his followers suffered under the harshness and severity of Quraysh who did their very best to persecute and torture the believers, hoping they could force them to give up their faith and return to the worship of idols and immorality. But the faith and firmness of the believers were exemplary and they were prepared to face death if they had to in order to remain faithful to Allah Almighty. After all efforts had been made to change the hearts of the obstinate Quraysh, the time had come for the Muslims to settle elsewhere and the Prophet (peace and blessings of Allah be upon him) chose Madinah. Slowly and secretly the Muslims started to travel to Madinah, trying to keep their movement away from the keen eyes of Quraysh. The Prophet (peace and blessings of Allah be upon him) was waiting for Allah Almighty to order him to leave and travel to Madinah. It was a sensitive time because Quraysh had reached the peak of anger and frustration at the growing number of Muslims and the fact that Islam was still continuing to spread despite their many efforts to thwart it. Abu Bakr (may Allah be pleased with him) remained behind in Makkah, waiting for the Prophet (peace and blessings of Allah be upon him) to receive the order from Allah Almighty to leave. He prepared two camels and provisions for the journey and waited patiently. Unaware of the Prophet’s (peace and blessings of Allah be upon him) plans, the Quraysh had devised a plot to kill the Prophet (peace and blessings of Allah be upon him) but Allah Almighty is the Best of Planners and He did not allow the disbelievers to succeed in their evil scheme. A group of young men, each one representing a tribe of Makkah, stood outside the Prophet’s (peace and blessings of Allah be upon him) home, intending to strike him (peace and blessings of Allah be upon him) one by one when he emerged and kill him. The Quraysh were proud of their wicked plan, thinking it would rid them of Islam once and for all without them having to answer to the tribe of the Prophet (peace and blessings of Allah be upon him) who could not retaliate against every tribe! Allah the All-Knowing Knew of their plot and guided the Prophet (peace and blessings of Allah be upon him) to safety. The Prophet (peace and blessings of Allah be upon him) asked Ali (may Allah be pleased with him) to sleep in his blessed bed that night and then under the protection of Allah Almighty, the Prophet (peace and blessings of Allah be upon him) left his house and walked past the waiting men. They did not see him! And when Ali emerged from the Prophet’s (peace and blessings of Allah be upon him) house the next morning they were astonished! They had no idea how that could have happened. Because they were without true faith, they could not comprehend how it is so easy for Allah Almighty to make such a miracle happen. When the Prophet (peace and blessings of Allah be upon him) left his house, he went to Abu Bakr (may Allah be pleased with him) and told him it was time for them to leave. Abu Bakr (may Allah be pleased with him) was ready! The greatest manhunt was underway! The Quraysh offered a great reward to anyone who would bring the Prophet (peace and blessings of Allah be upon him) back, dead or alive. How evil they were, and how great is the mercy, guidance and protection of Allah Almighty. 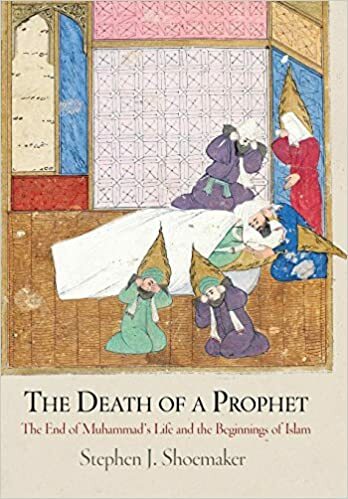 Quraysh expected the Prophet (peace and blessings of Allah be upon him) would head to Madinah, but he (peace and blessings of Allah be upon him) and Abu Bakr (may Allah be pleased with him) headed off in the opposite direction at first to mislead their enemies. They camped out in a cave for some time and during this time a great lesson along with an ayat of Quran was revealed. When first entering the cave Abu Bakr (may Allah be pleased with him) was so concerned about the Prophet’s (peace and blessings of Allah be upon him) safety and wellbeing that he insisted on entering first to rid it of any dangerous creatures, like scorpions. When he was satisfied that it was safe he and the Prophet (peace and blessings of Allah be upon him) entered it and stayed quietly there. Asma, a daughter of Abu Bakr, used to bring them food and news from Makkah. She showed great courage in doing this and she used to hide the food in her clothing and creep out of the city going into the desert. At one time, one of the disbelievers thought she knew where the Prophet (peace and blessings of Allah be upon him) was and struck her harshly, trying to get her to talk, but she said nothing! At one point, when the Prophet (peace and blessings of Allah be upon him) and Abu Bakr (may Allah be pleased with him)were in the cave a group of men, eager to get the reward money, stepped very close to the entrance of the cave. Abu Bakr (may Allah be pleased with him) could see their feet and was very afraid the Prophet (peace and blessings of Allah be upon him) would be found. He did not care for his own safety; all his thoughts and concern were with the Prophet (peace and blessings of Allah be upon him) and the great responsibility he felt in accompanying him on this very important journey. Abu Bakr (may Allah be pleased with him) whispered his fears to the Prophet (peace and blessings of Allah be upon him) who comforted him saying (what means): “What do you think of two, whose third is Allah?” The Prophet (peace and blessings of Allah be upon him) was telling his great friend Abu Bakr (may Allah be pleased with him) that they should not fear as Allah was with them. And Indeed, Allah Almighty protected them because He caused a bird to build a nest and lay eggs at the entrance of the cave and a spider to spin its web across the cave entrance. In this way, the enemies of the Prophet (peace and blessings of Allah be upon him) were convinced that he could not possible be in the cave. When the time was right, the Prophet (peace and blessings of Allah be upon him) and Abu Bakr (may Allah be pleased with him) left the cave and continued on their journey to Madinah. If was a long and difficult journey and the Muslims were in Madinah, eagerly awaiting their arrival. Every day men would go to the outskirts of the town, climb tall trees and try to see if the blessed Prophet (peace and blessings of Allah be upon him) was approaching. Many days passed and still there was no sign of the Prophet (peace and blessings of Allah be upon him). There was no way for them to know that the Prophet (peace and blessings of Allah be upon him) was safe; they just had to trust in Allah and wait. They had left their homes, undergone much difficulty and faced many dangers. Without the Prophet (peace and blessings of Allah be upon him) to lead them, what would they do? It was a test of their faith and patience. At last, the happy day arrived! 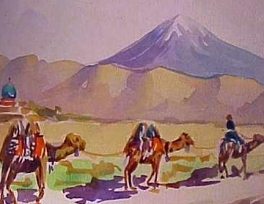 The men, who were watching the desert every day, looking for signs of the travelers, saw dust rising in the distance! As the figures drew closer, it became clear there were two of them! And then when they drew even closer it was clear that finally the blessed Prophet (peace and blessings of Allah be upon him) had arrived! News spread quickly throughout the town. People in their shops, in the market, and in their homes heard the news that the Prophet (peace and blessings of Allah be upon him) had arrived. Everyone rushed to welcome the Prophet (peace and blessings of Allah be upon him)! They sang songs of joy, prayed and followed him (peace and blessings of Allah be upon him) as he entered the city. The Prophet (peace and blessings of Allah be upon him) humbly allowed his camel to be guided by Allah Almighty to the place where he would stay. Everyone wanted the blessing of having the Prophet (peace and blessings of Allah be upon him) stay with them, so letting the camel stop where it chose showed the Prophet’s (peace and blessings of Allah be upon him) great mercy and wisdom. There were many more trials to come but the Muslims, now in Madinah, had the Prophet (peace and blessings of Allah be upon him) with them. He was teaching them, advising them, and guiding them. Living in his midst was a great blessing and they knew it. They attended to their duties, gathered with him (peace and blessings of Allah be upon him) and grew in faith. The Prophet (peace and blessings of Allah be upon him) had left the city he loved so well, seeking the pleasure of Allah. And now, in Madinah, he (peace and blessings of Allah be upon him) continued to seek His pleasure and proclaim the message of Islam. Should I believe that story dear curious-lurker?? Nah...noooo ,, we got to move on.. Ha!.. think about those Harry potter series ..
No need to believe the "story". The dating is still the same, regardless of its actual origins. Thanks for the reply yeezevee. No, I don’t think we need to believe that story itself to use the calendar system. Revisionists question the meaning of Hijra and may disagree with the traditional narrative of a migration from Mecca to Medina, but both AH/CE convention is used to denote dates in the literature. Spot on. Just because one might not be a Christian or not believe Jesus existed does not mean one does not use CE or AD or that these dating systems are wrong. what year did it happen? who was responsible for that? what is its relation to Quran verses? and why is it based on a lunar calendar consisting of 12 months in a year of 354 or 355 days? and who was the intellectual behind that? is Lunar calendar better or solar calendar better for earthlings?